Tough guys like pizza too and they aren't afraid to show it! 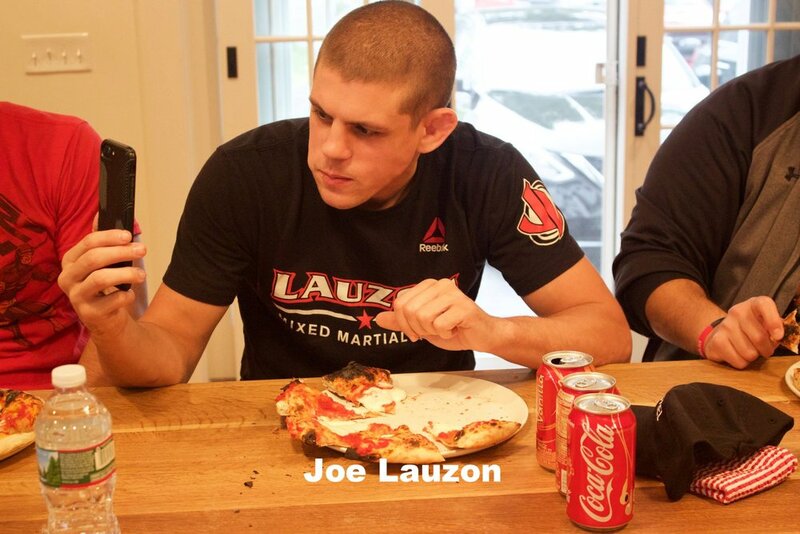 One of our favorite New England "tough guys", UFC fighter, Joe Lauzon made a return appearance at the Baking Steel Test Kitchen today for the second annual Pizza-thon! Baking Steel Creator, Andris Lagsdin and Culinary Director, Fresh Chef Craig were slinging pies like there was no tomorrow, all in the name of raising money for The Jimmy Fund. Joe and six of his friends/teammates ate, ate, and ate, until they couldn't feel their faces! 200+ slices later adds up to one successful fundraiser! Baking Steel donated $5/slice eaten to the Jimmy Fund in honor of Joe's son, Joey Lauzon who was diagnosed with neuroblastoma at just 5 days old. Good food, good friends, good cause....not bad for a rainy Wednesday!